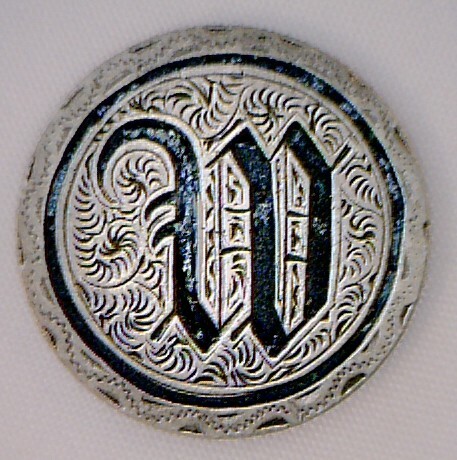 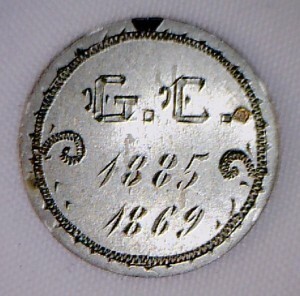 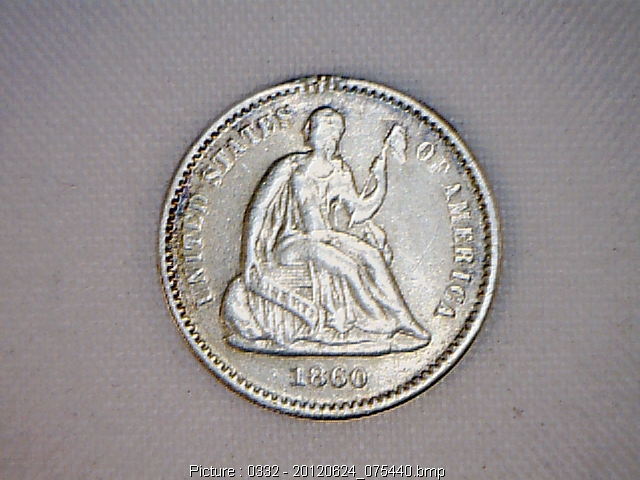 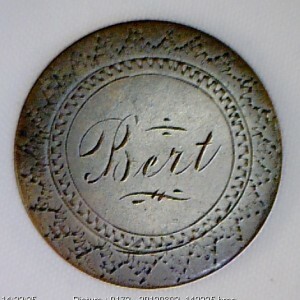 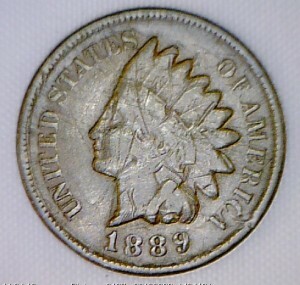 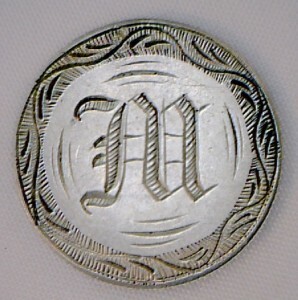 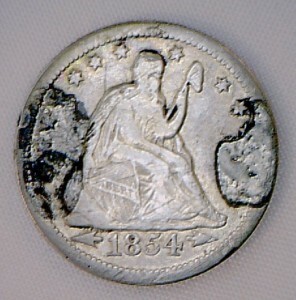 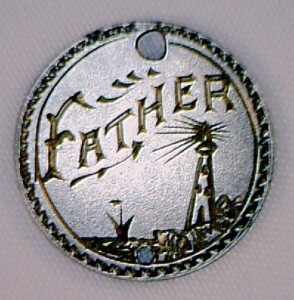 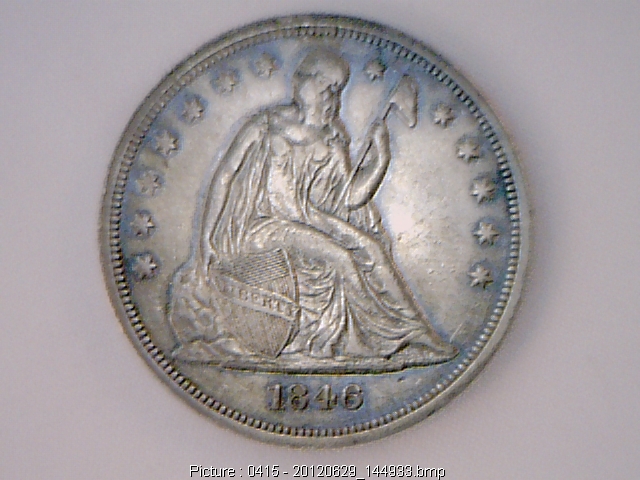 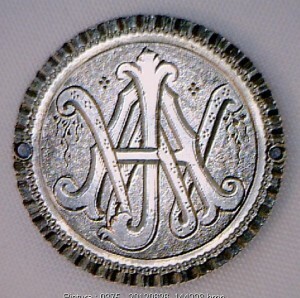 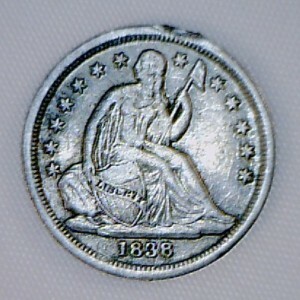 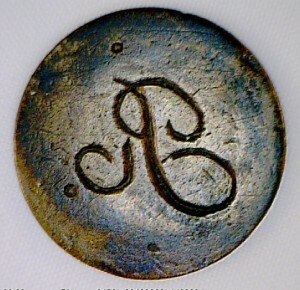 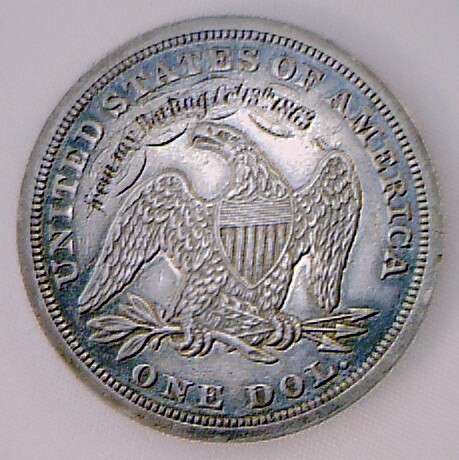 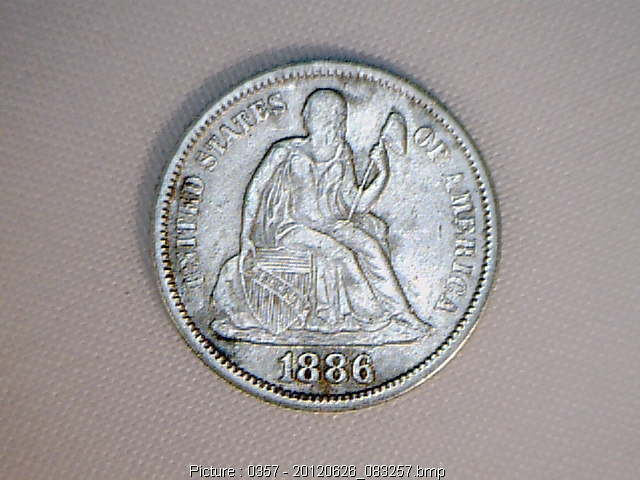 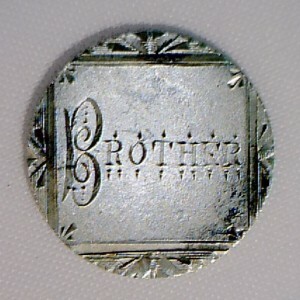 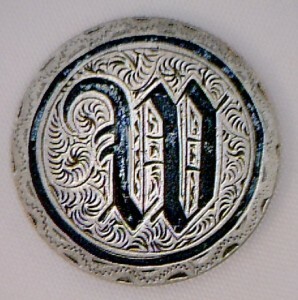 Often love token collectors focus on a specific area to collect. 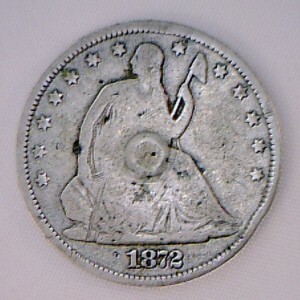 There are so many categories for collecting and it is difficult to do it all unless one has been collecting for decades. 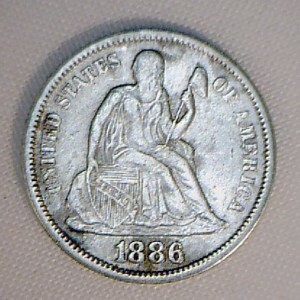 Pictorials have always been a visual favorite. 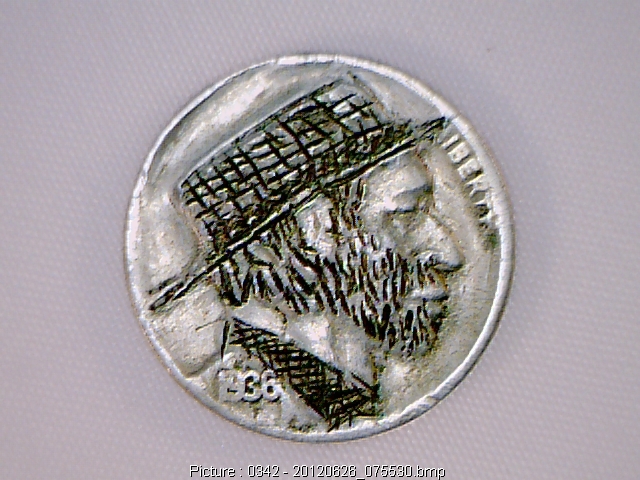 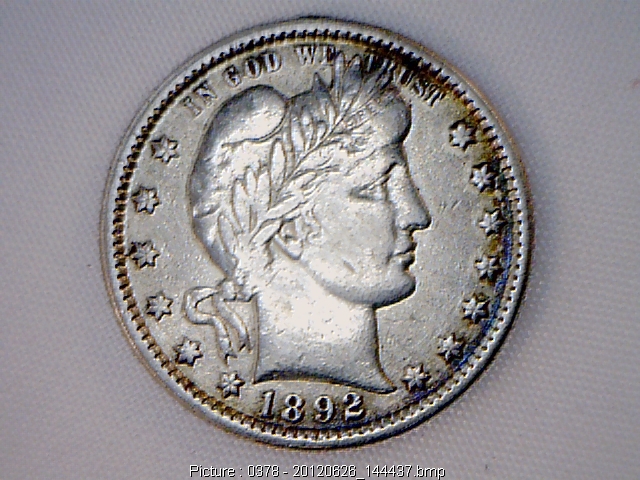 While other collectors go at it from more of a traditional coin collecting approach. 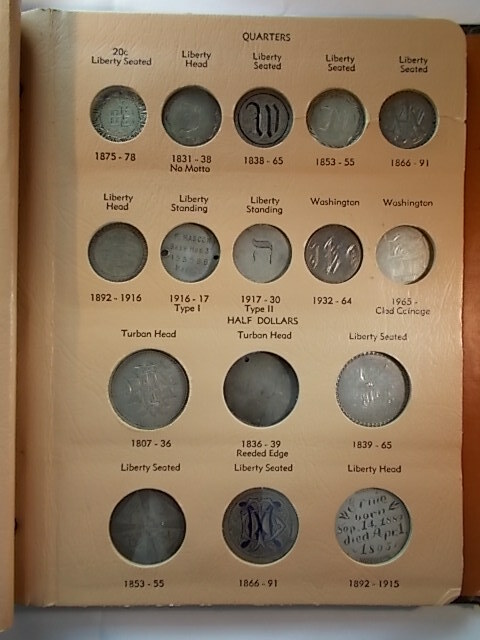 Type sets or year date sets have been collected and housed in coin albums. 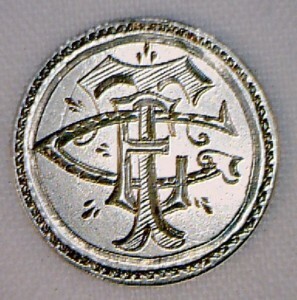 Great concept, but love tokens are sometimes “square pegs” that do not fit into round holes. 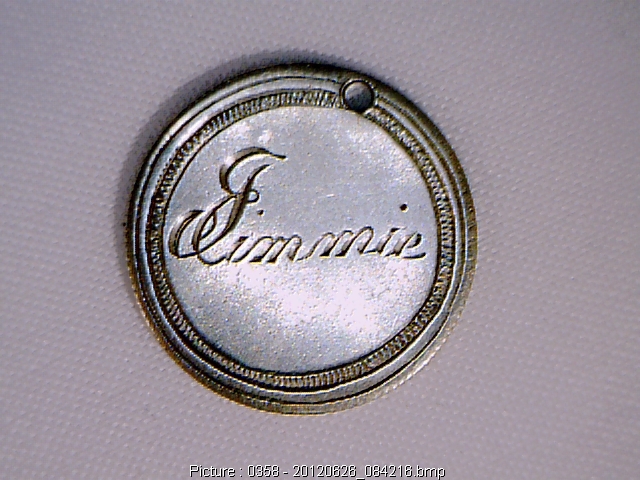 Think of the pins, bracelets, added loops, or even jump rings. 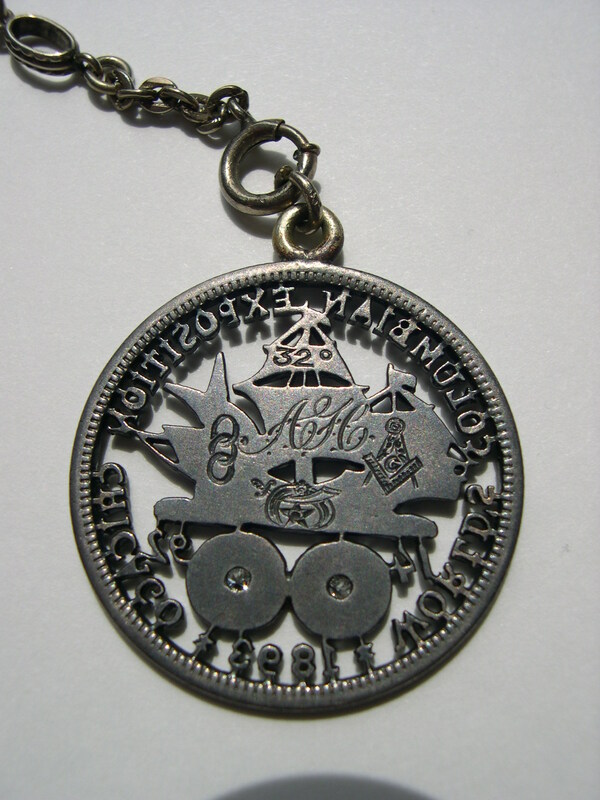 Now the jump rings can be removed without hurting the coin or its integrity as a historical piece. 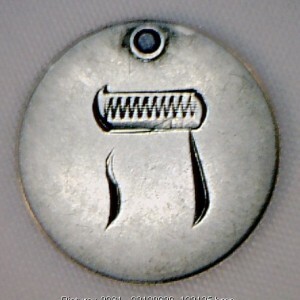 Just use two pliers to hold the jump ring while bending. 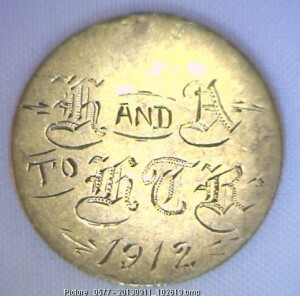 Do not use only one pair and the coin for leverage while bending. 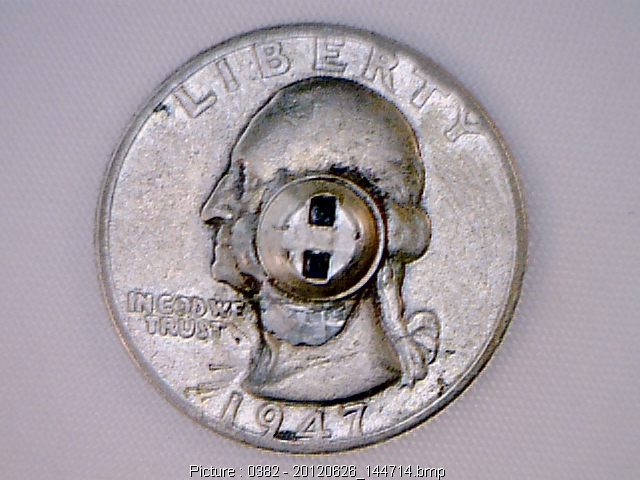 This will either crimp/bend the hole or make the hole break through. 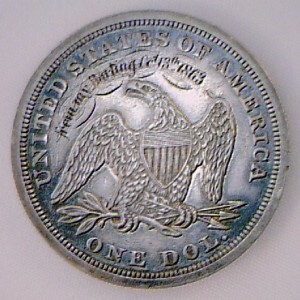 A split hole really affects the look and value of the love token. And, the thought of damaging something that has survived 100 plus years is sad. 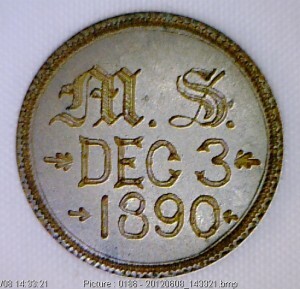 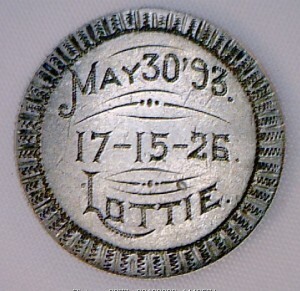 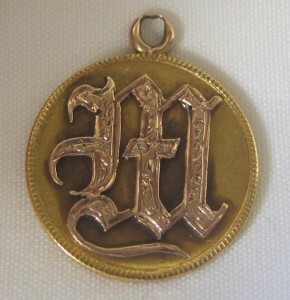 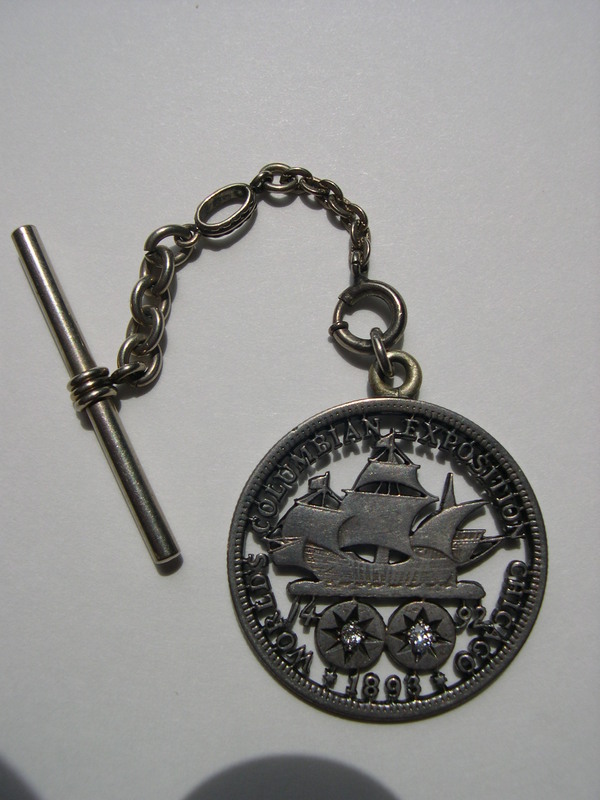 In the same respect, removing a pin or dismantling a bracelet is altering the history of the love token. 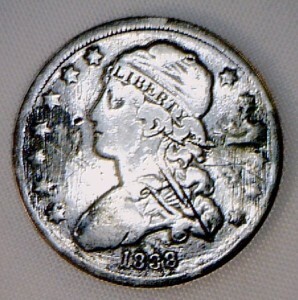 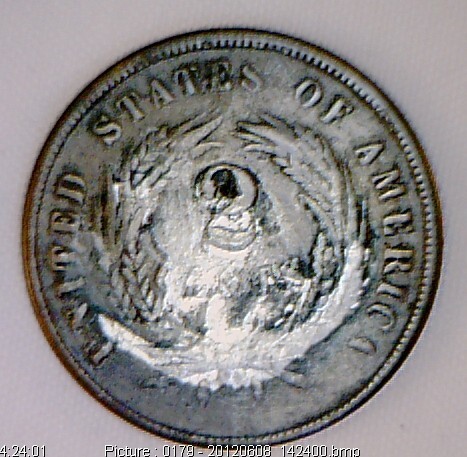 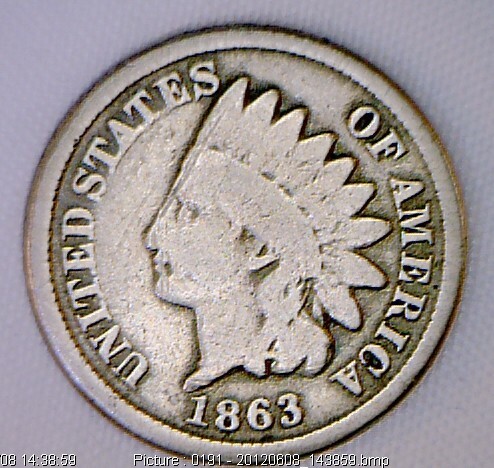 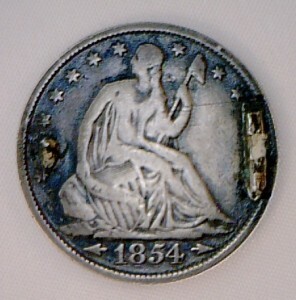 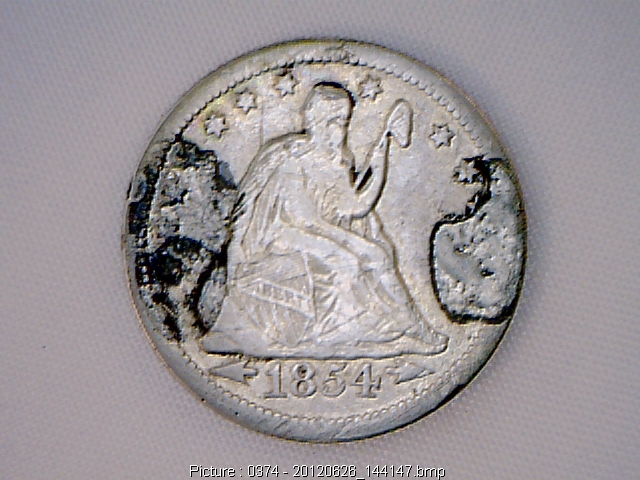 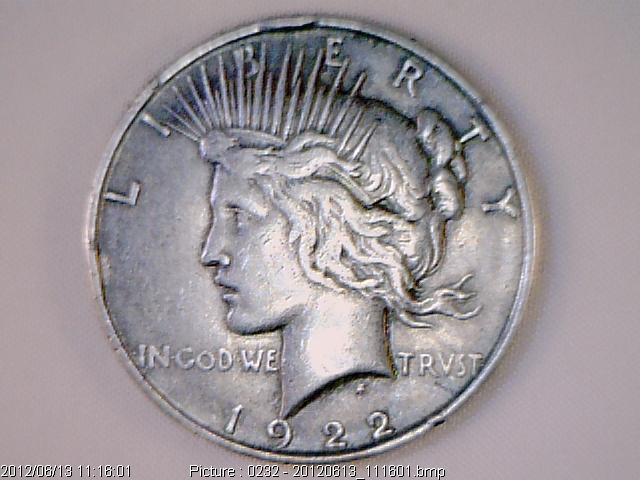 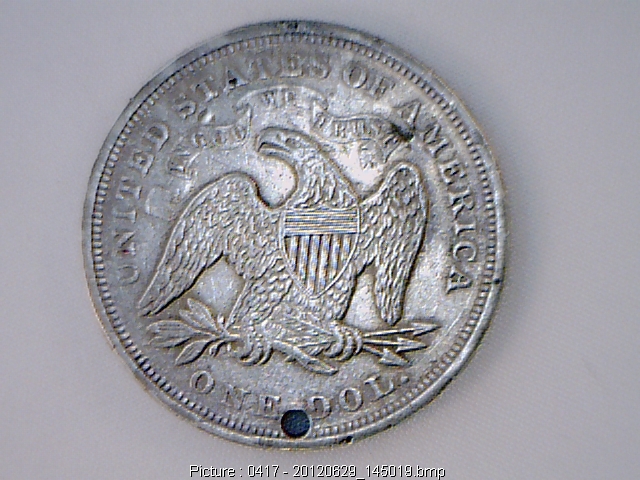 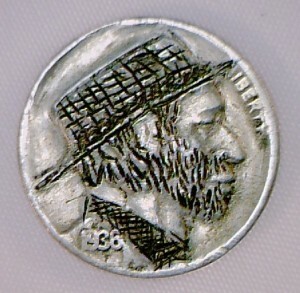 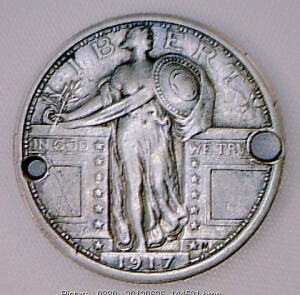 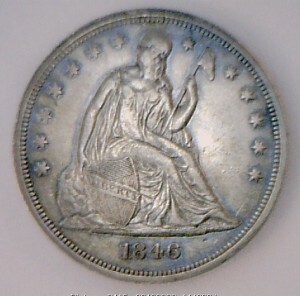 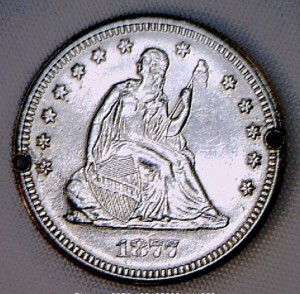 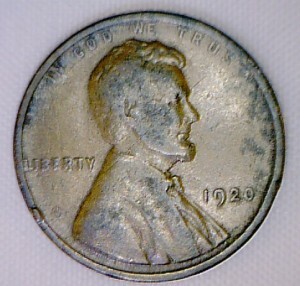 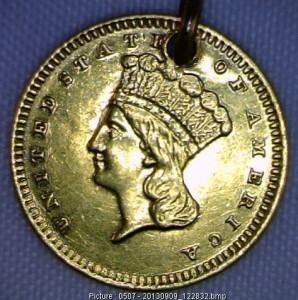 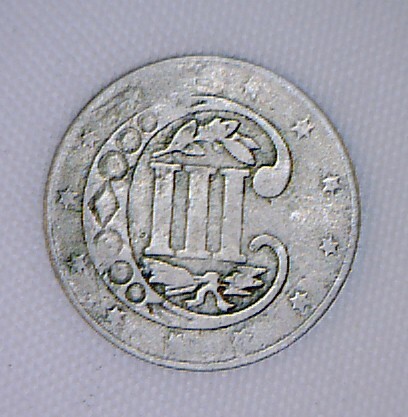 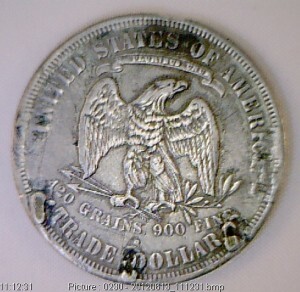 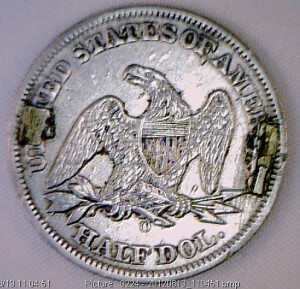 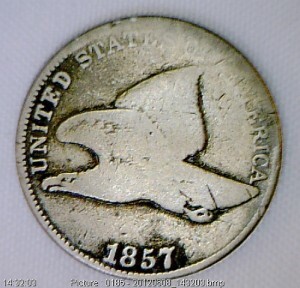 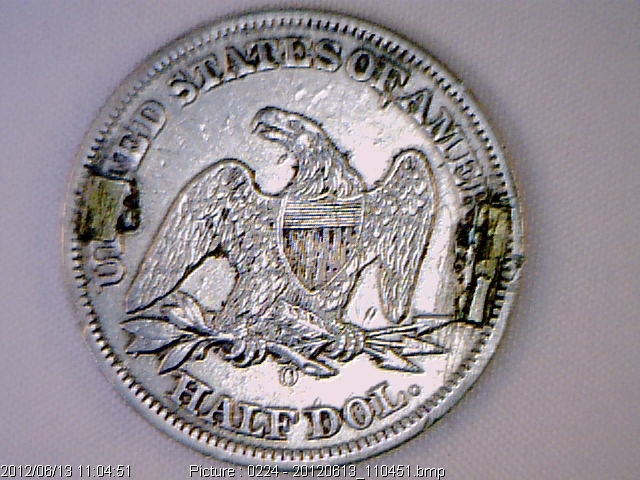 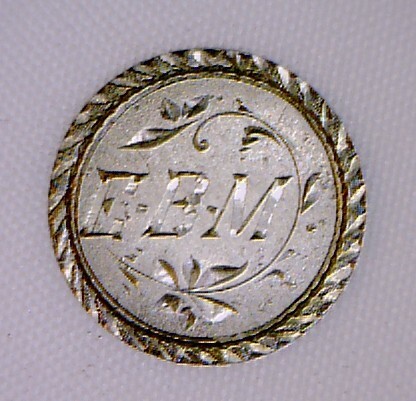 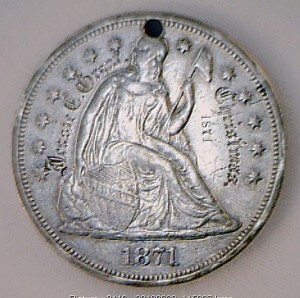 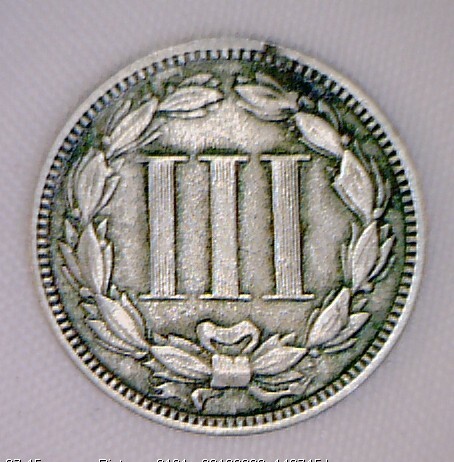 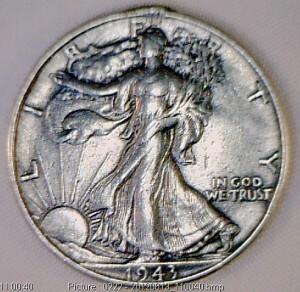 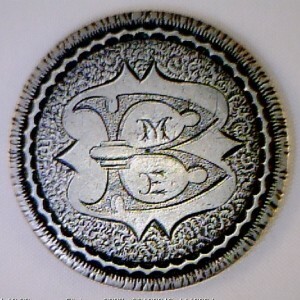 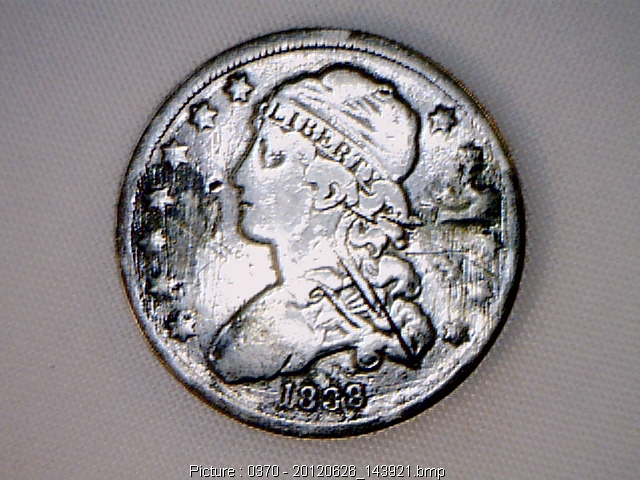 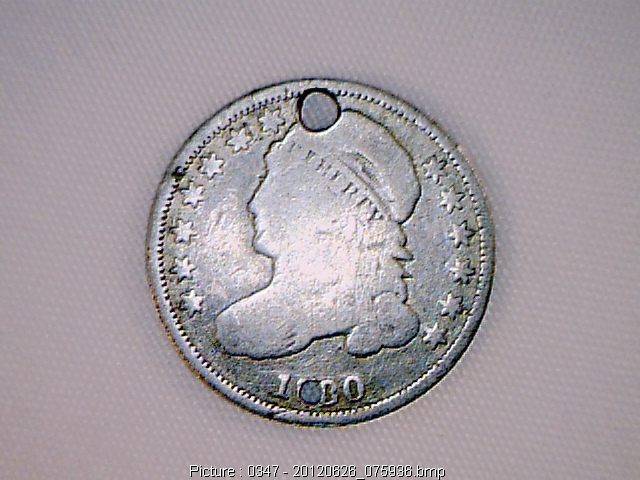 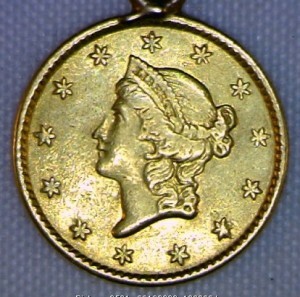 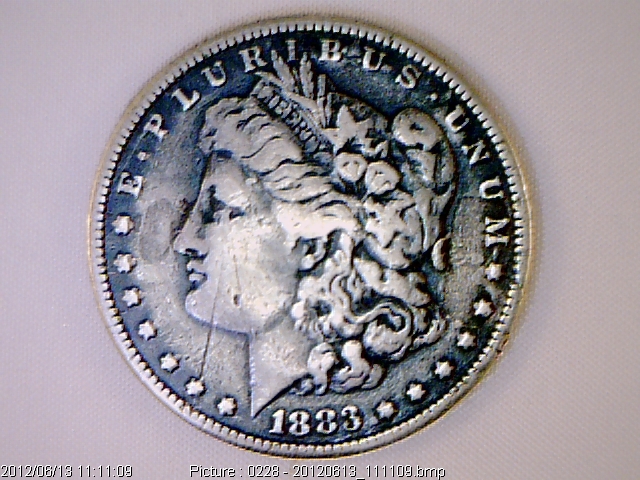 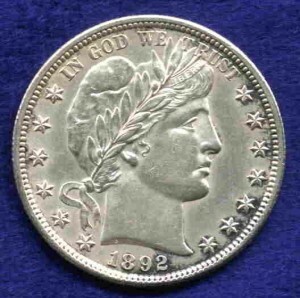 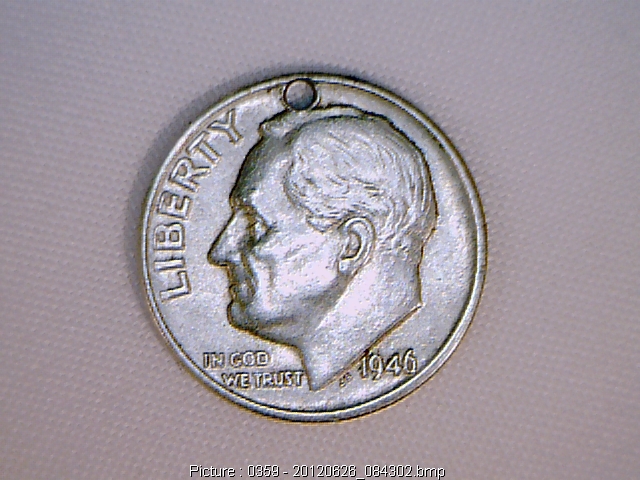 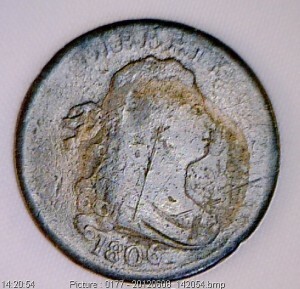 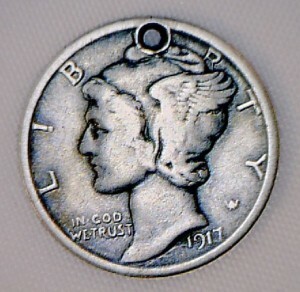 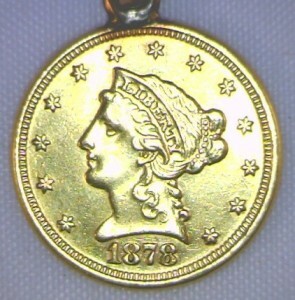 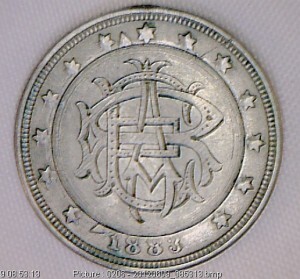 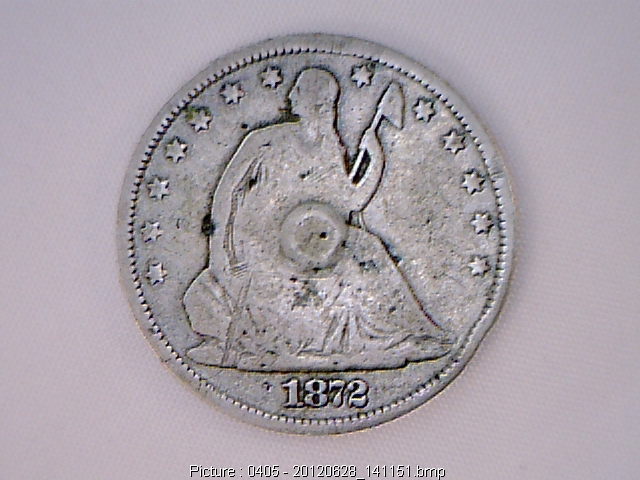 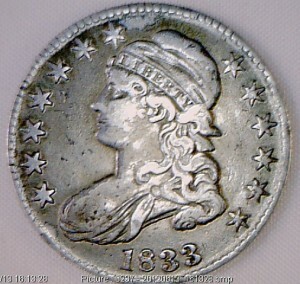 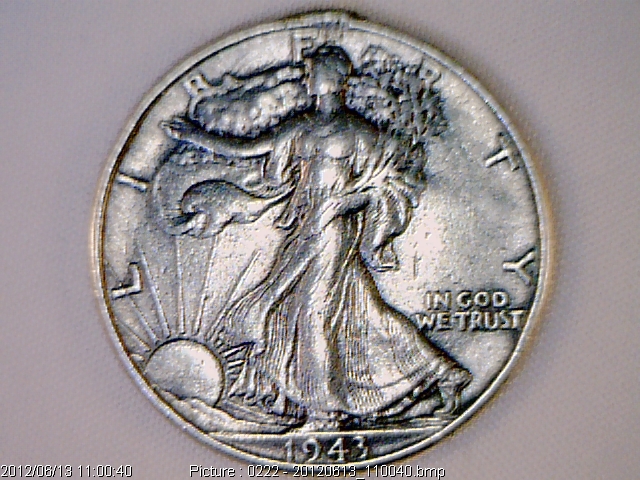 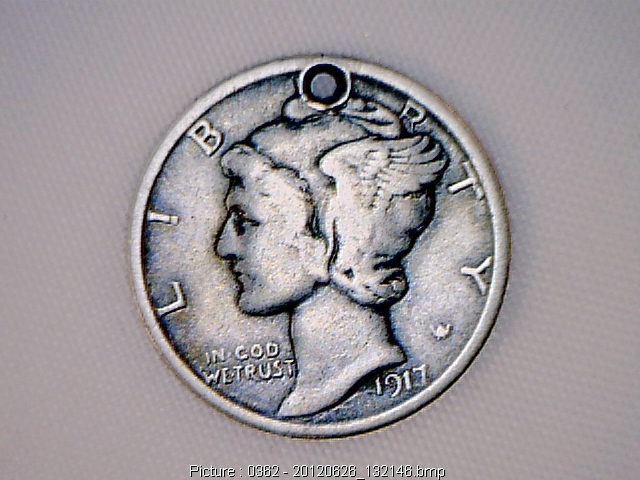 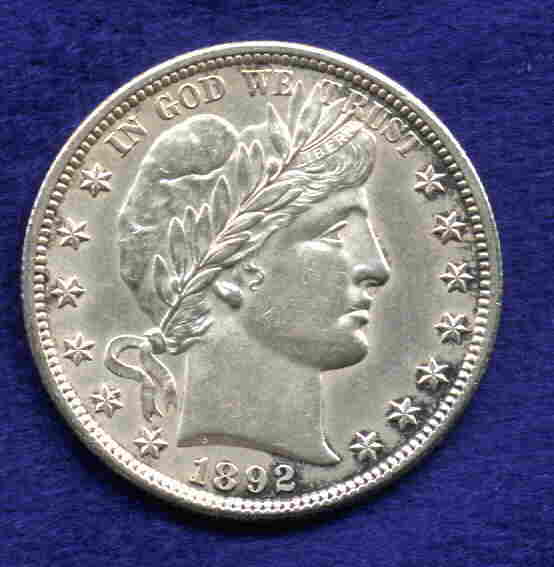 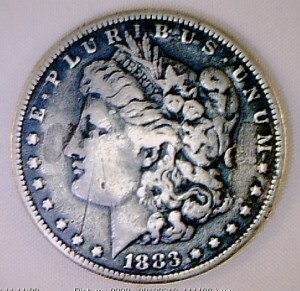 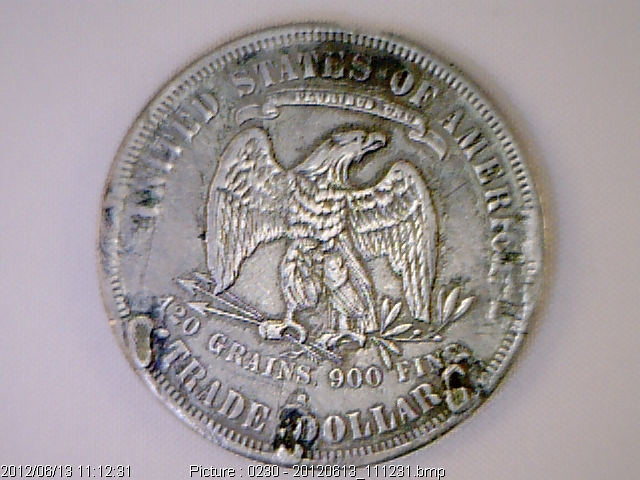 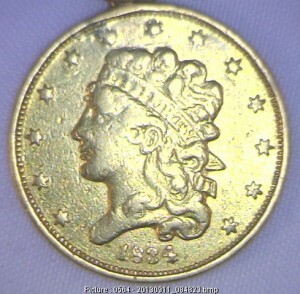 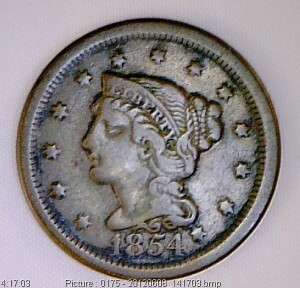 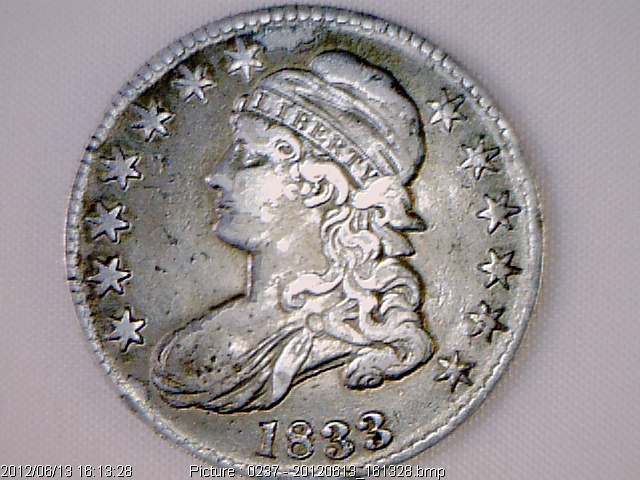 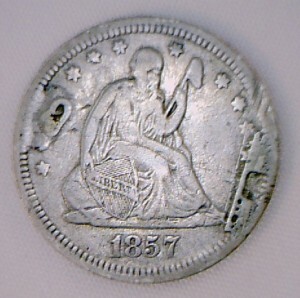 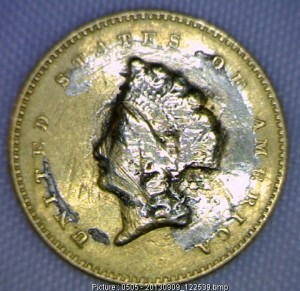 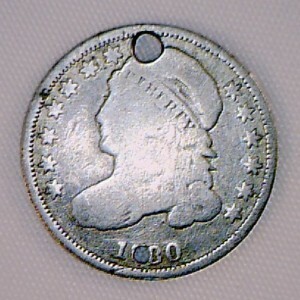 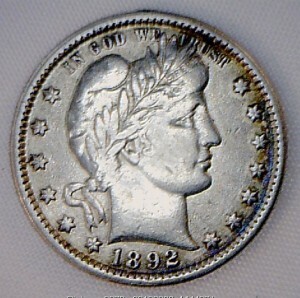 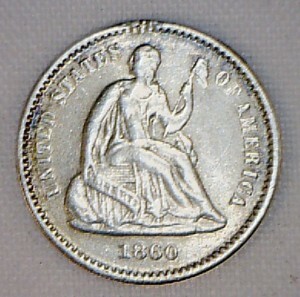 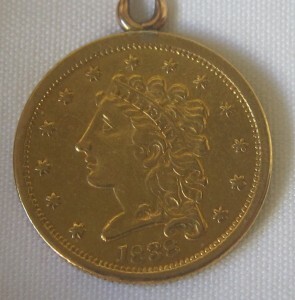 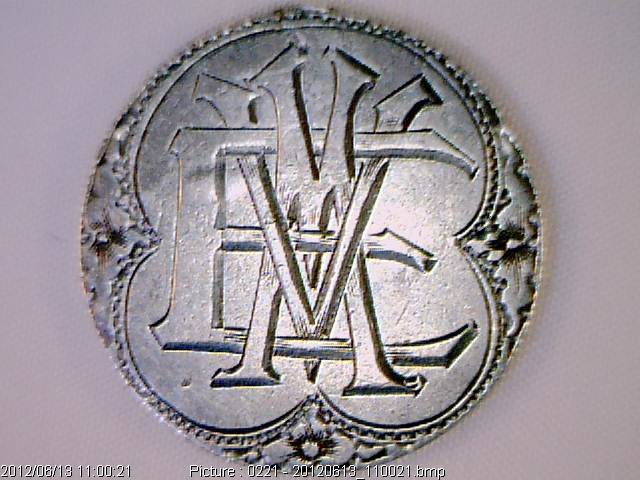 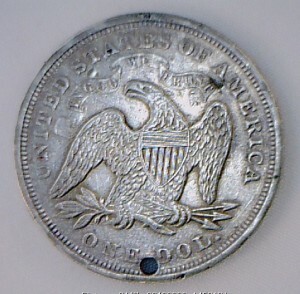 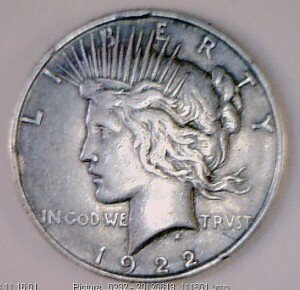 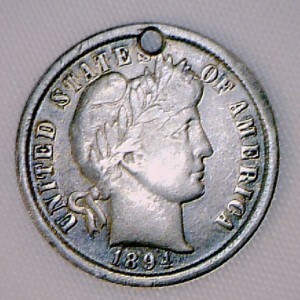 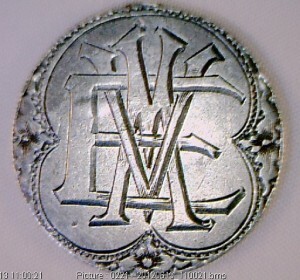 Removing a pin also leaves unattractive marks on the coin. 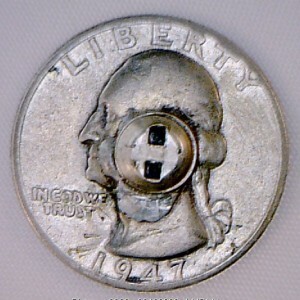 Now some have been removed because the pin broke and that is more acceptable. 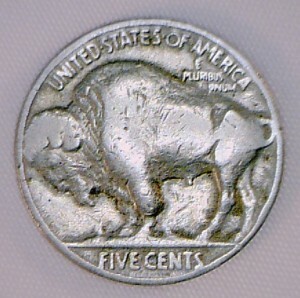 Coins with a single loop can still be added to an album. 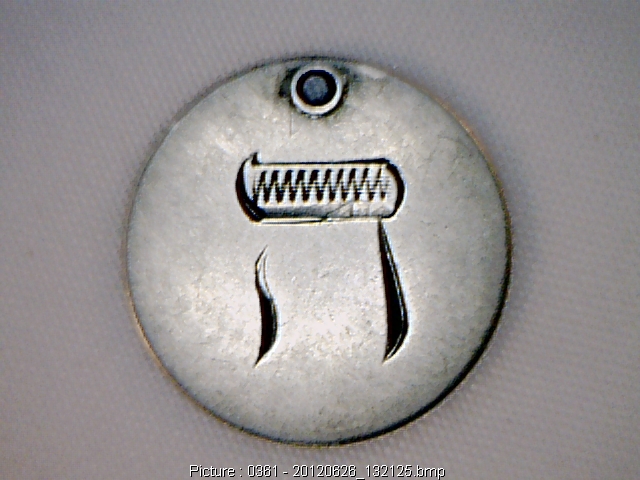 Simply get a knife and whittle a little hole between the layers of the cardboard album and slide the loop into the slit as the coin is inserted in its slot. 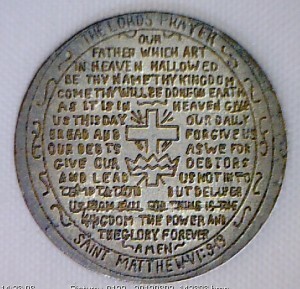 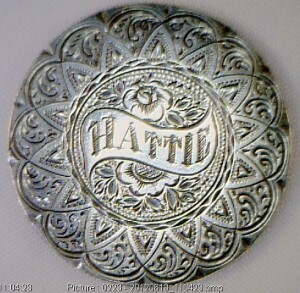 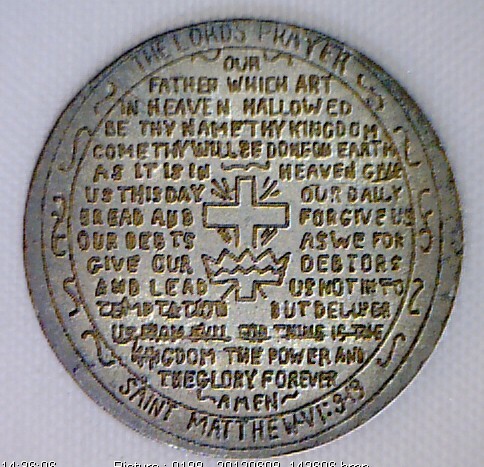 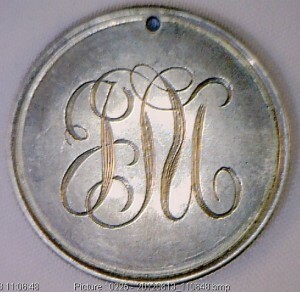 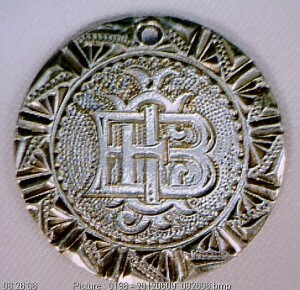 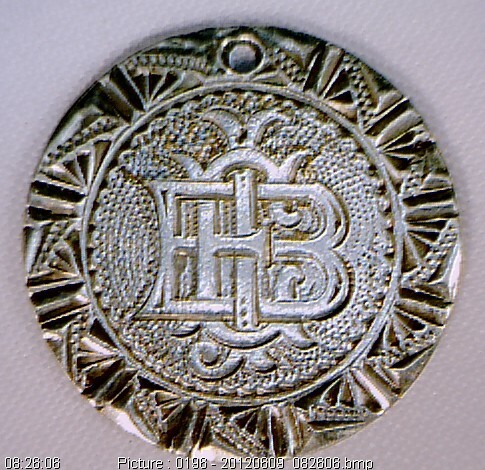 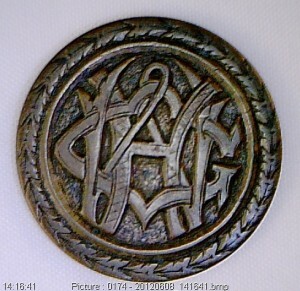 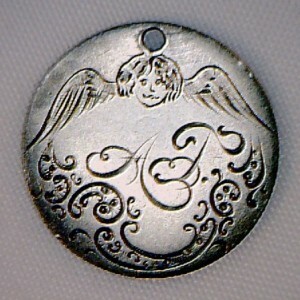 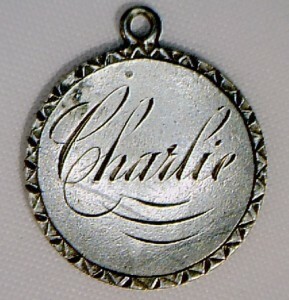 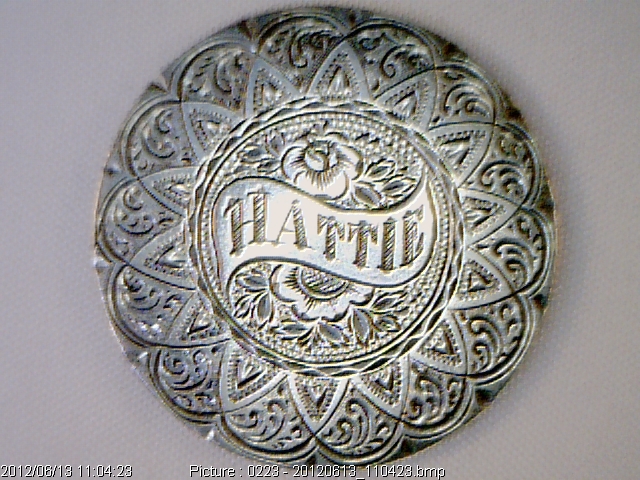 will focus on the most appealing engraving rather than the highest grade example. 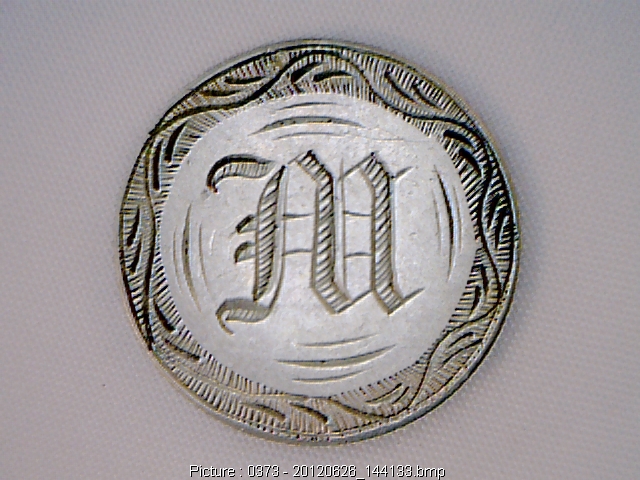 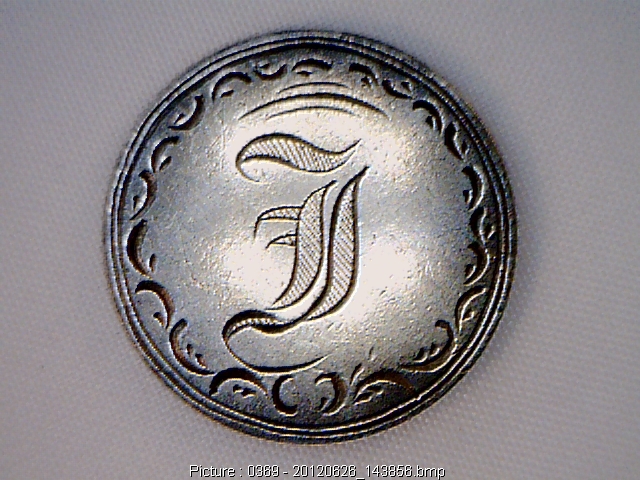 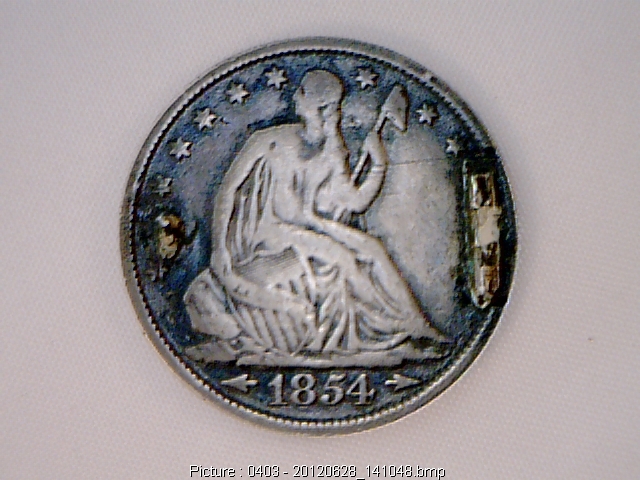 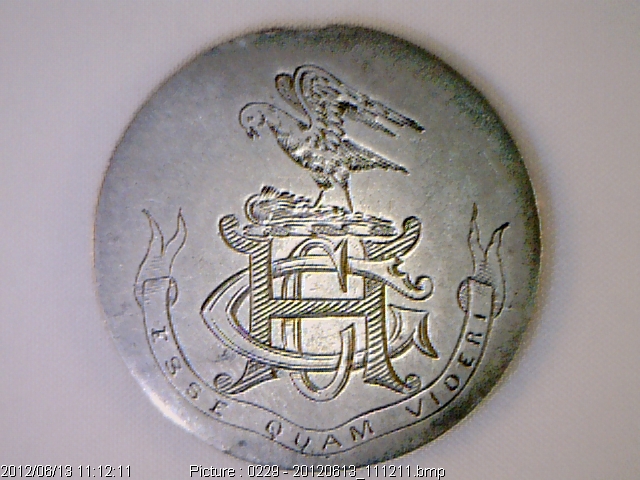 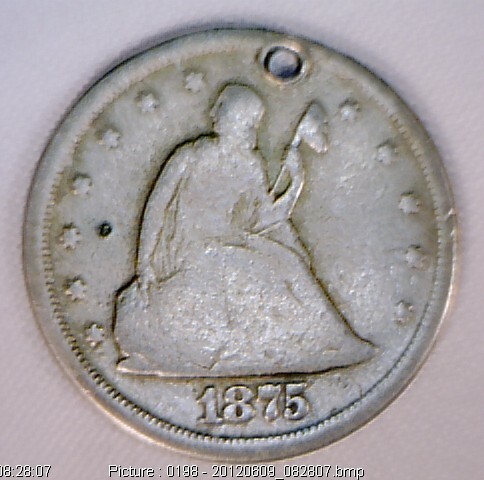 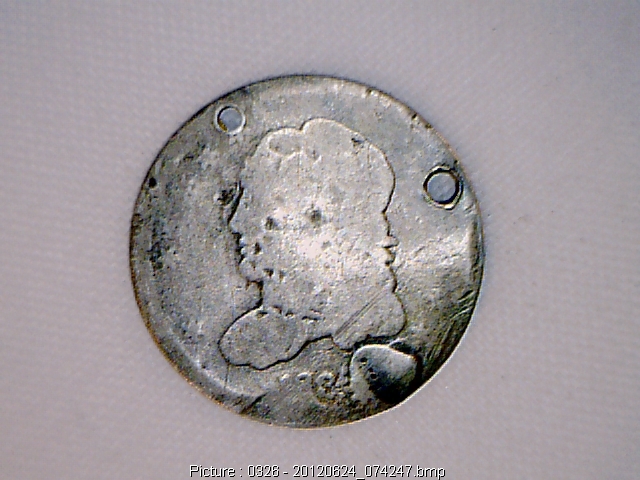 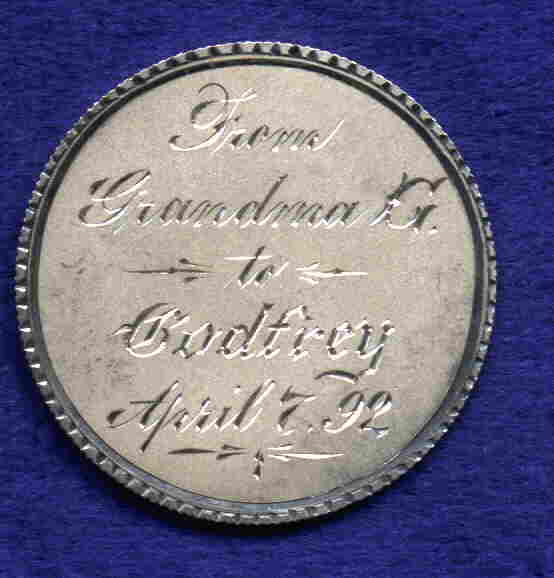 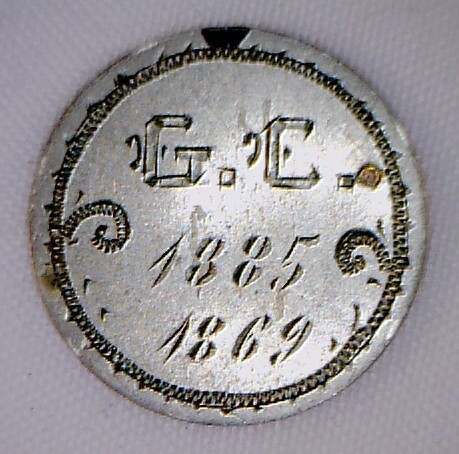 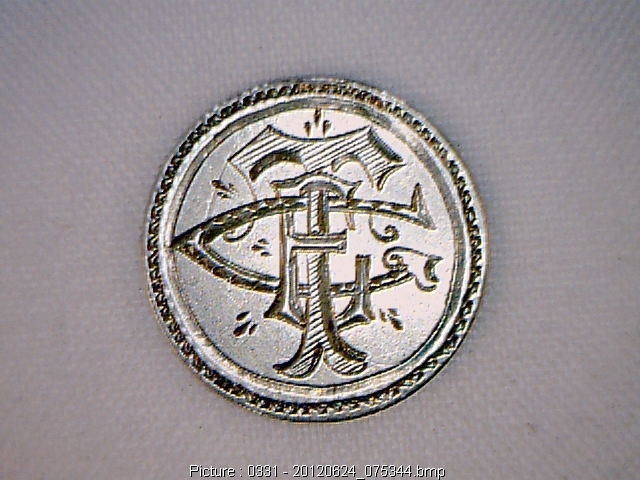 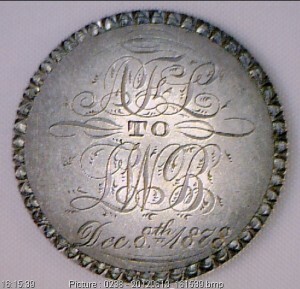 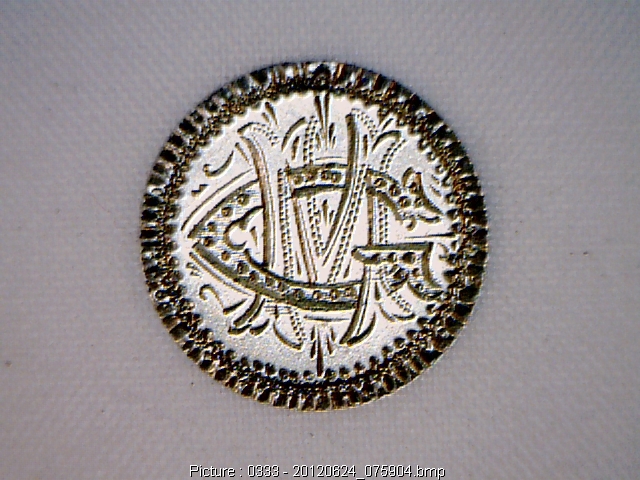 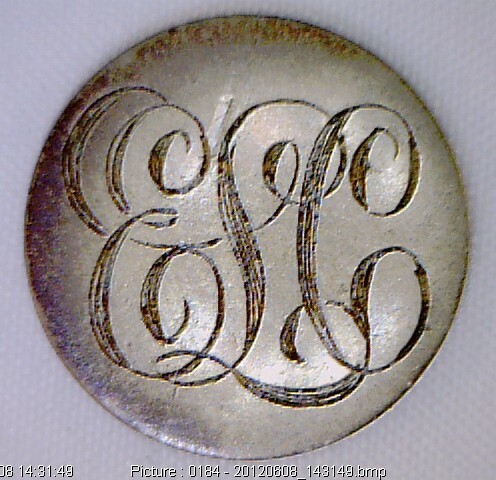 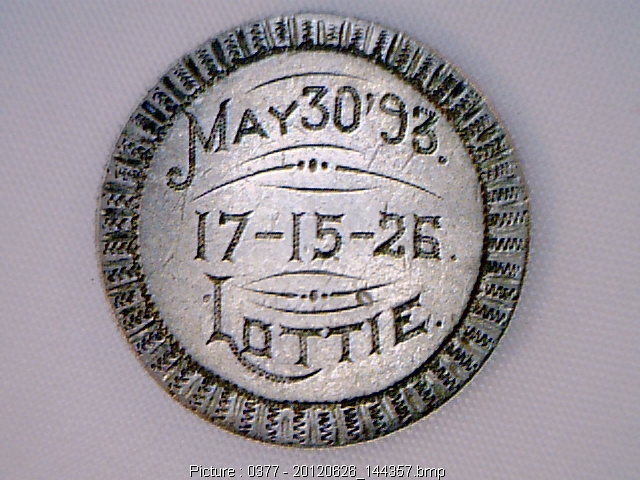 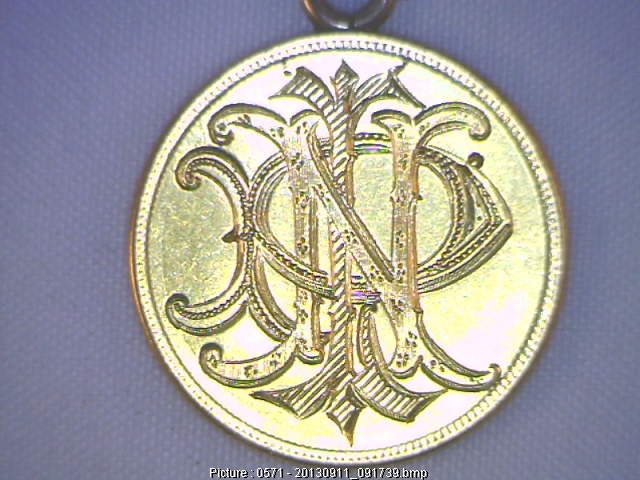 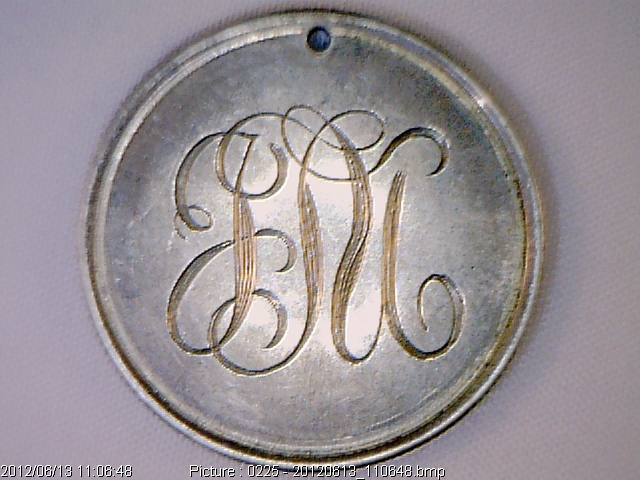 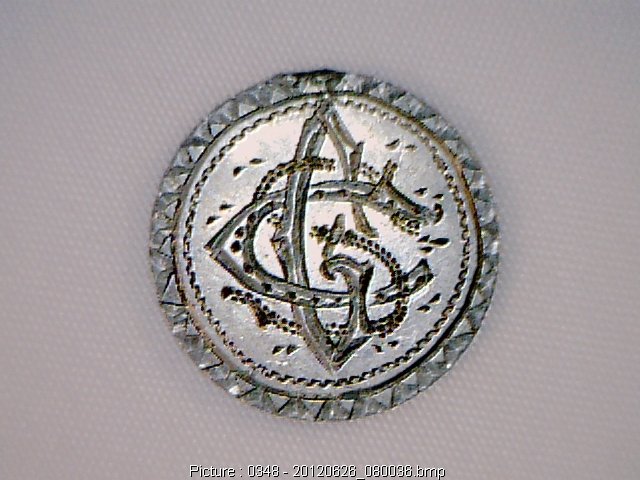 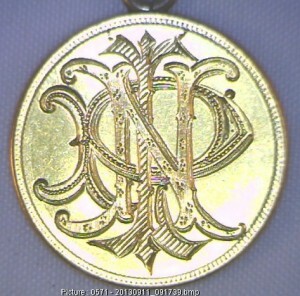 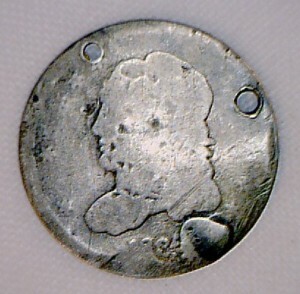 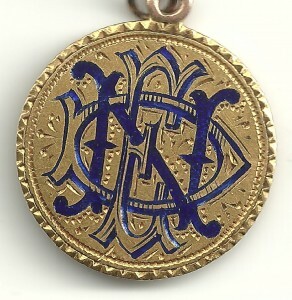 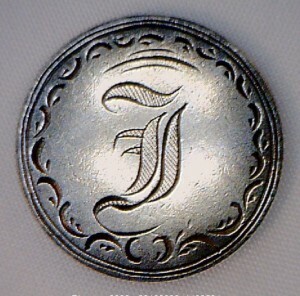 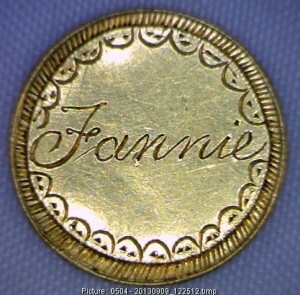 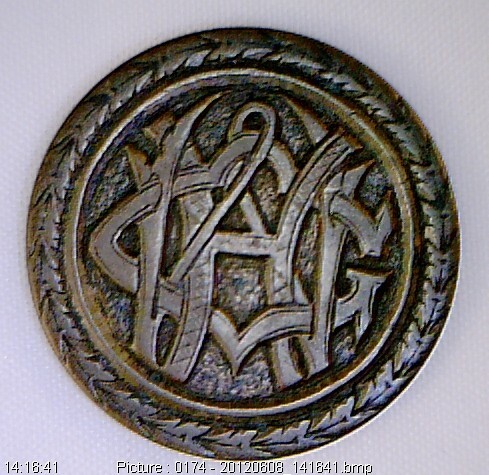 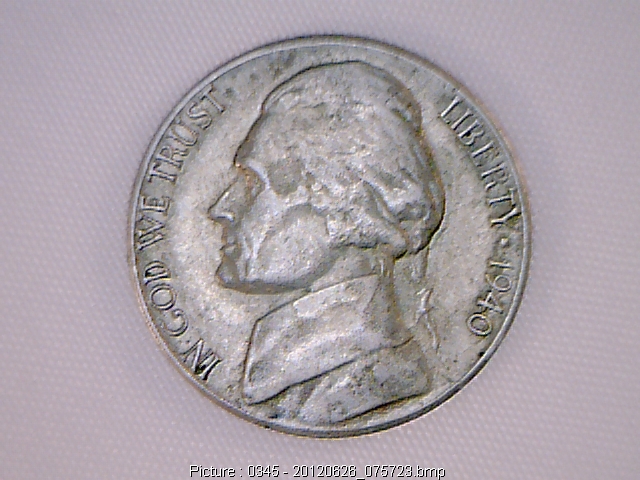 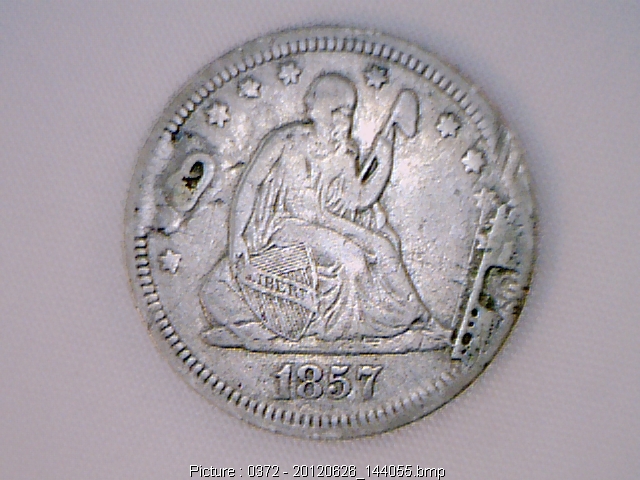 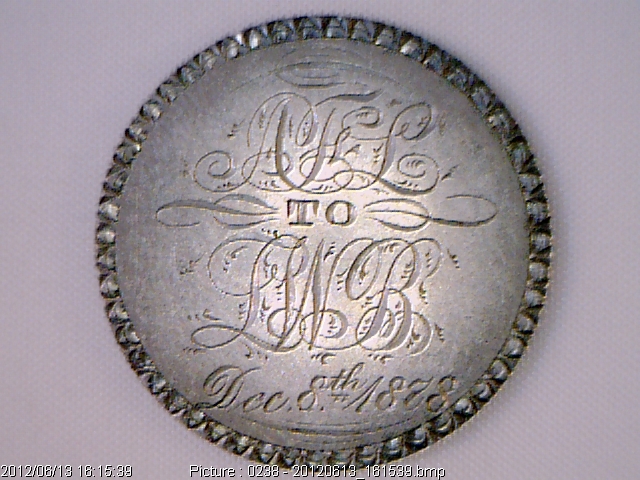 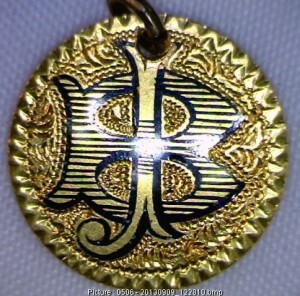 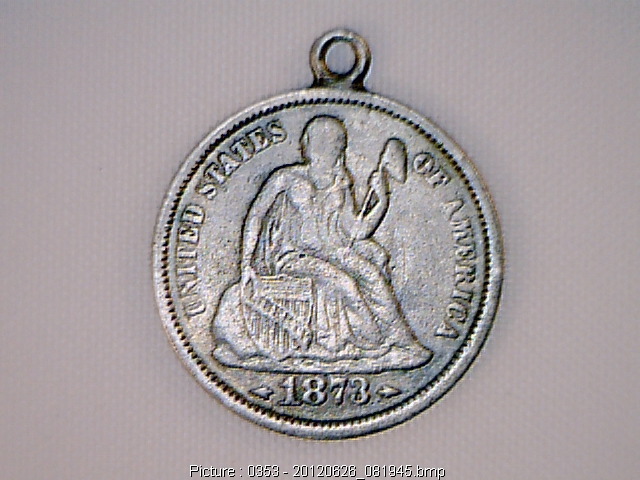 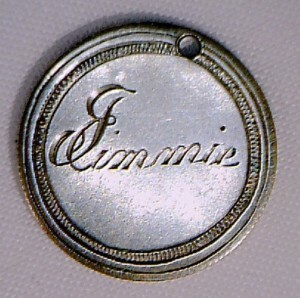 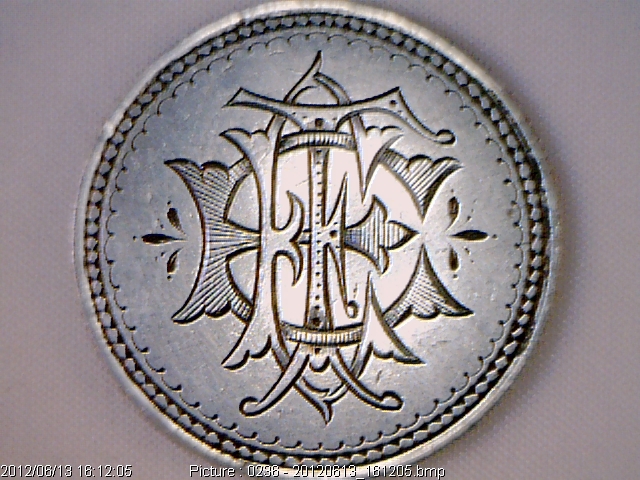 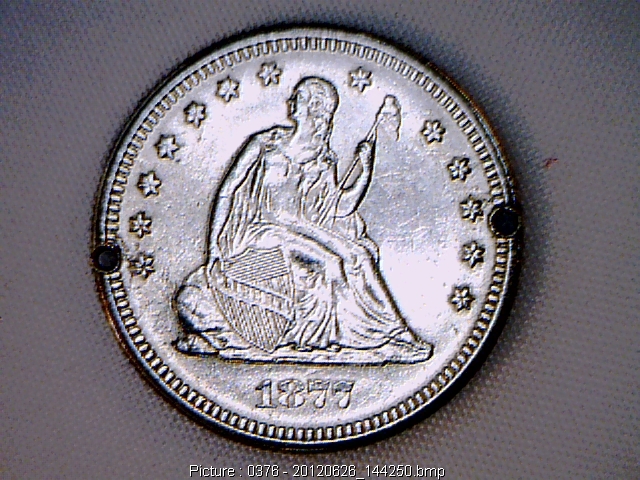 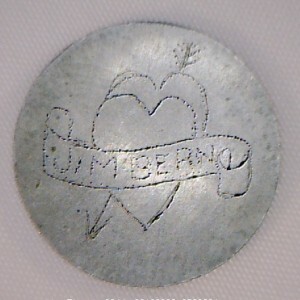 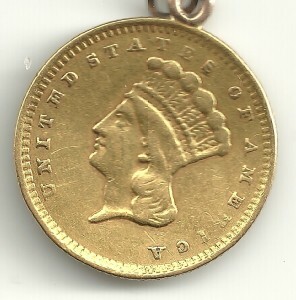 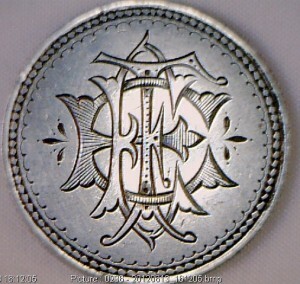 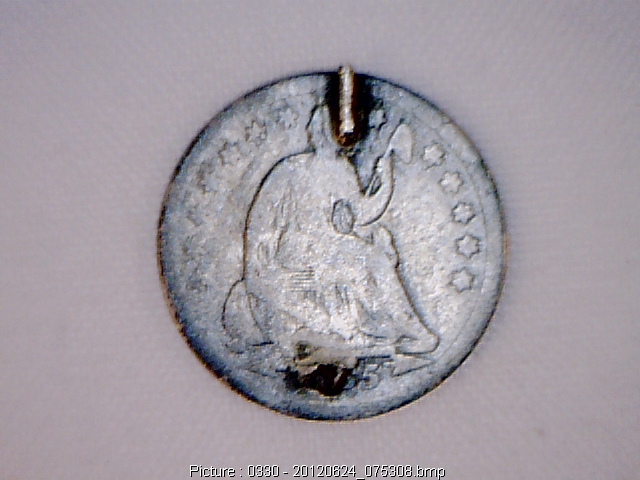 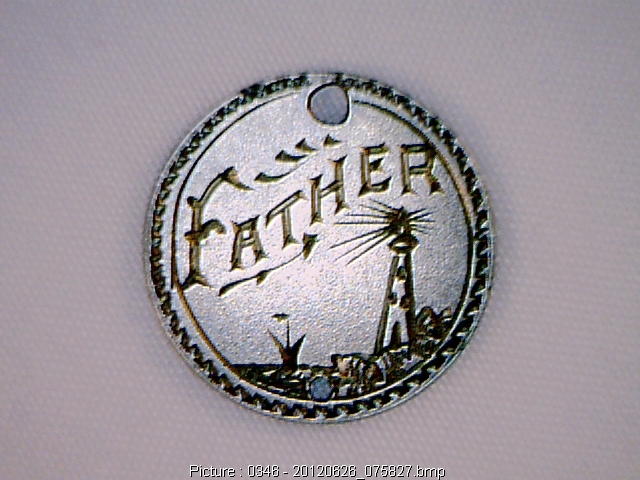 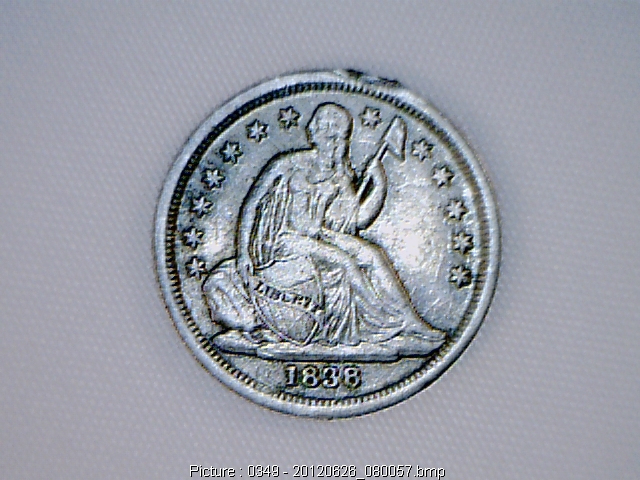 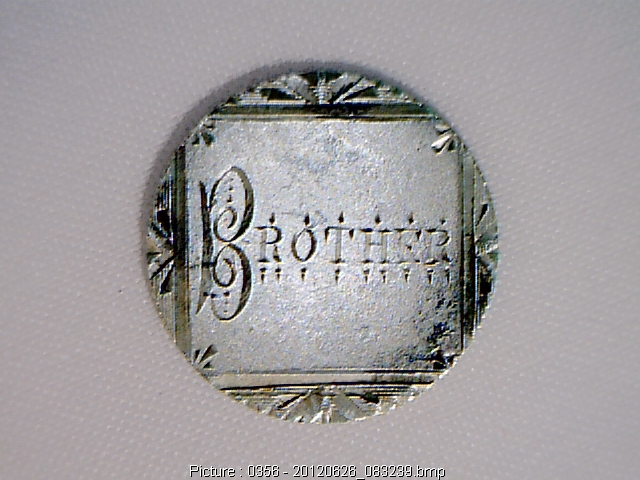 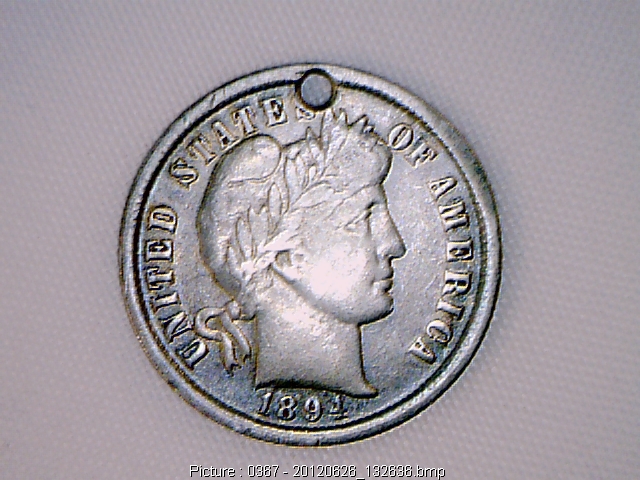 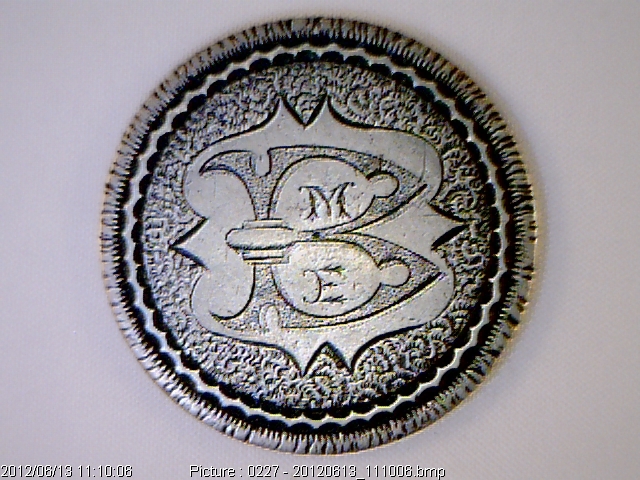 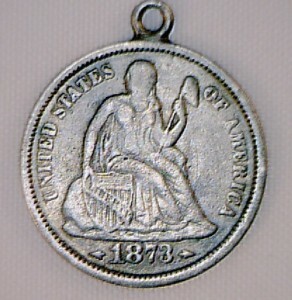 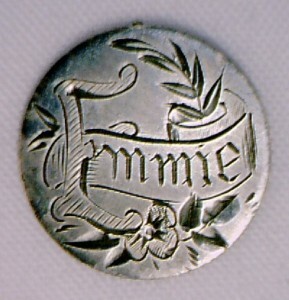 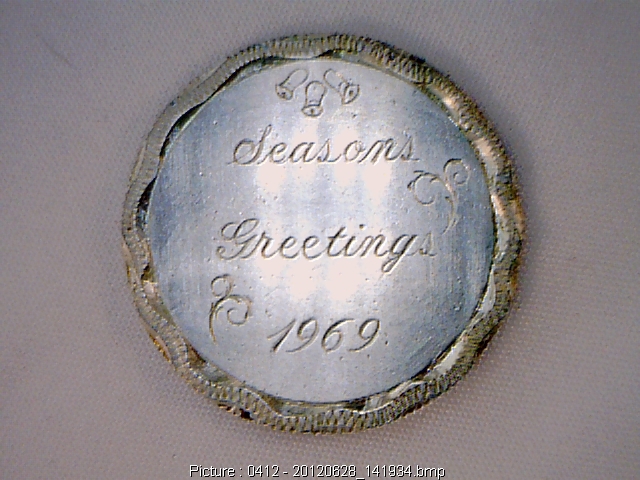 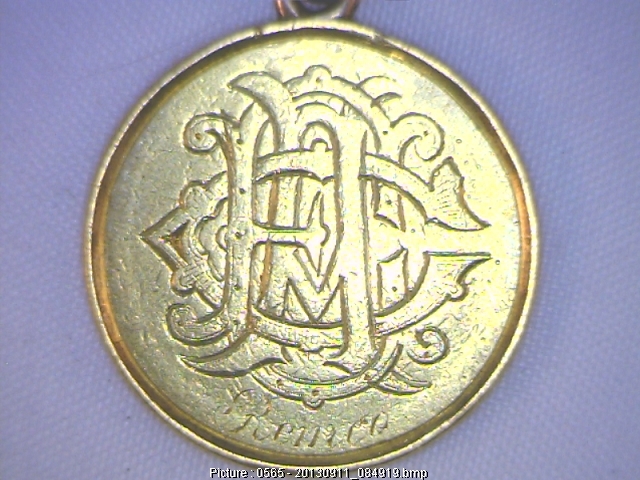 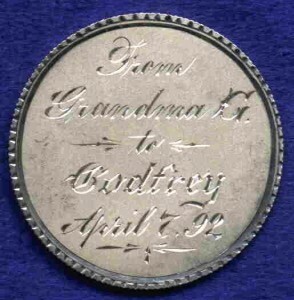 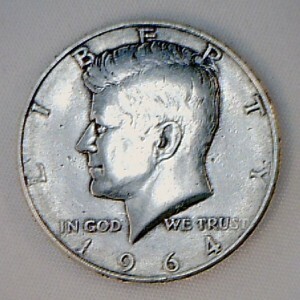 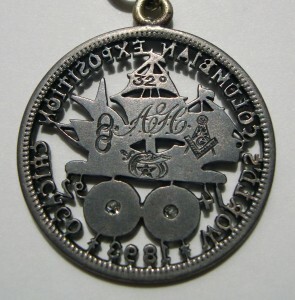 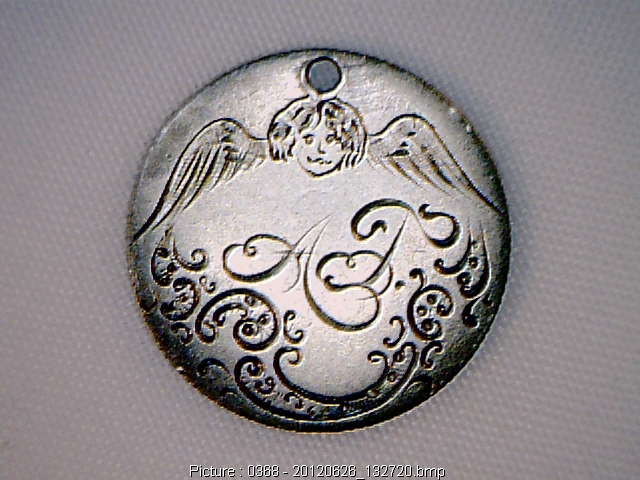 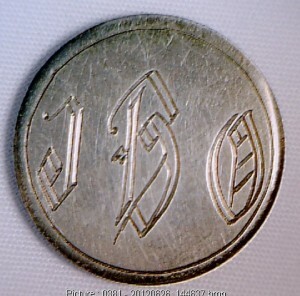 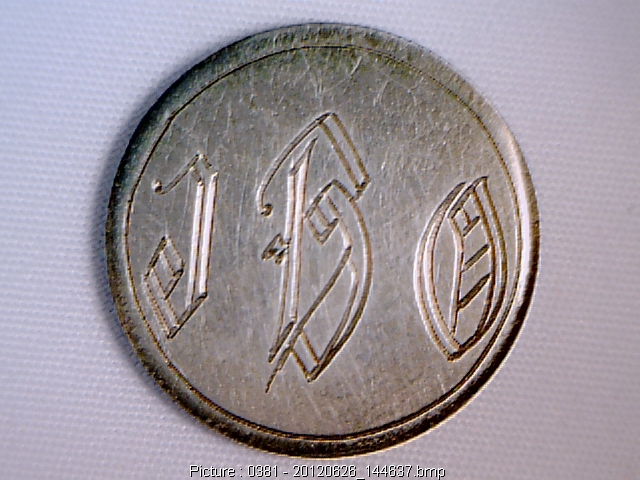 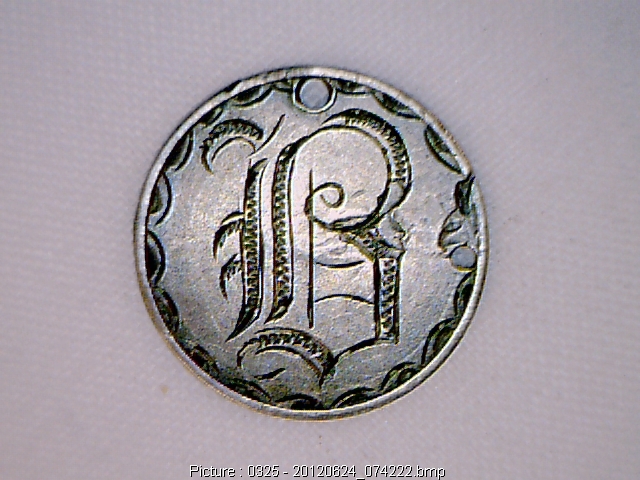 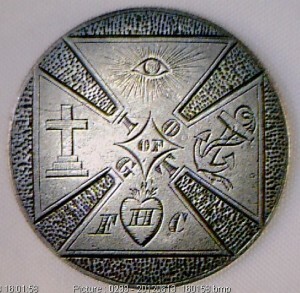 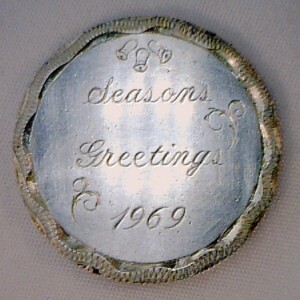 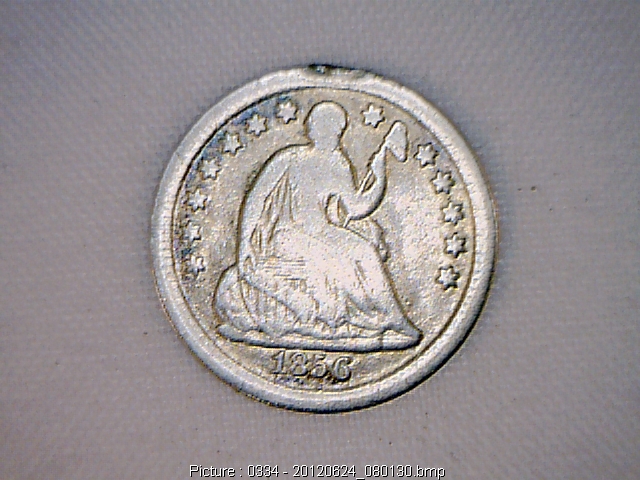 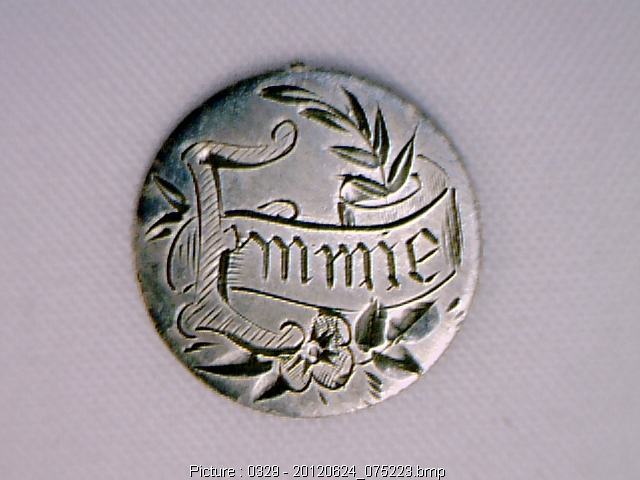 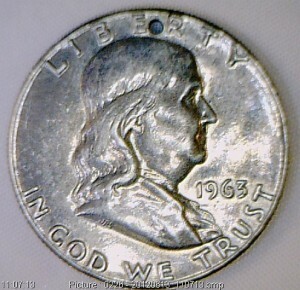 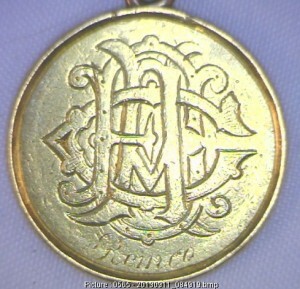 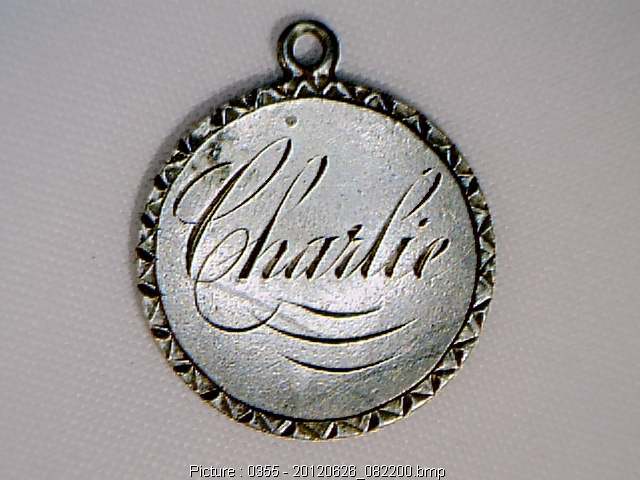 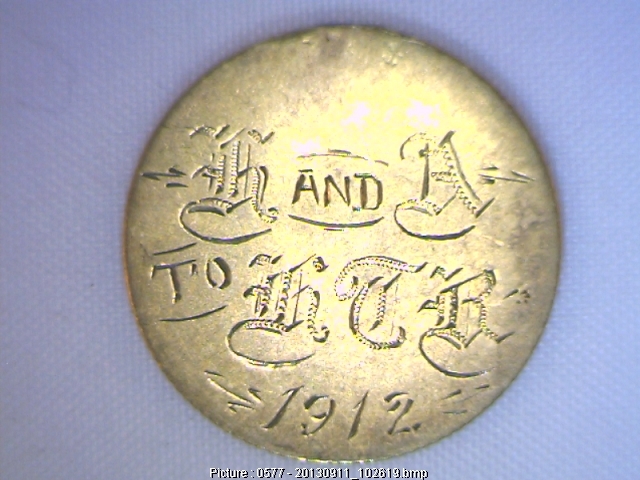 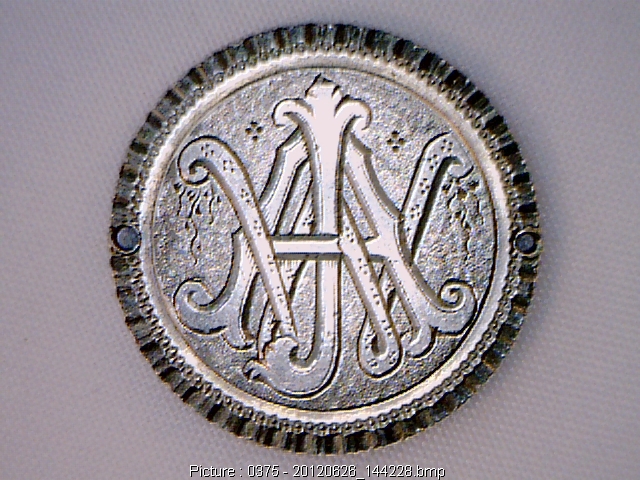 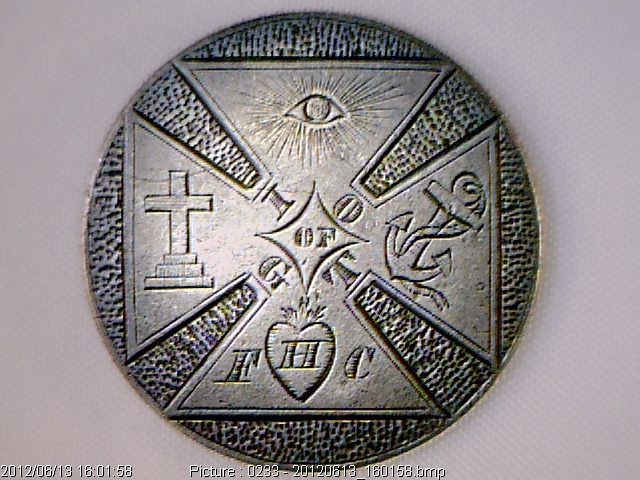 Note: obverse images are the engraved side of the love token. 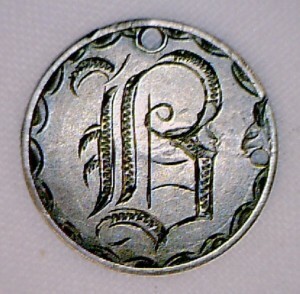 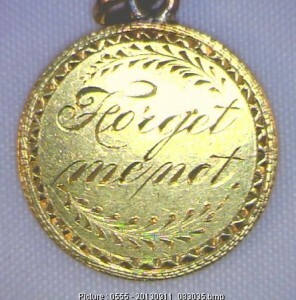 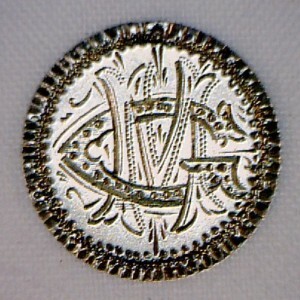 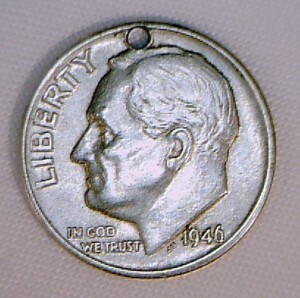 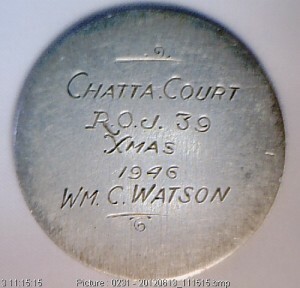 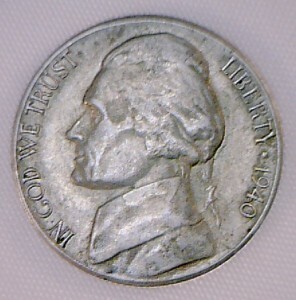 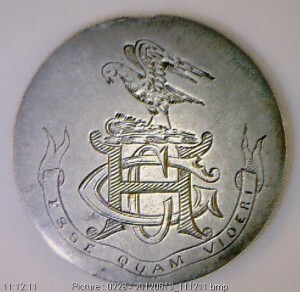 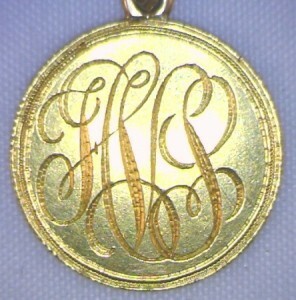 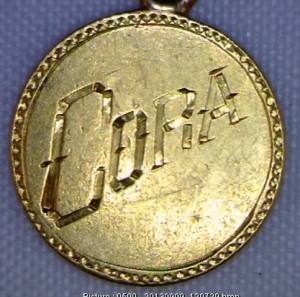 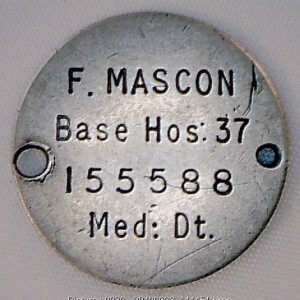 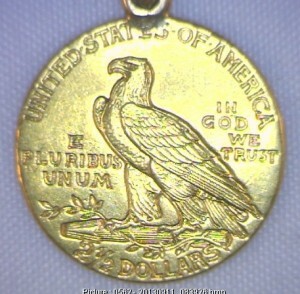 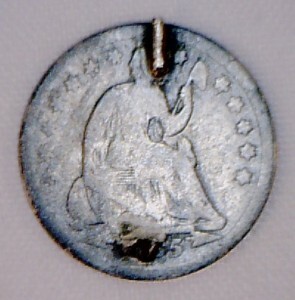 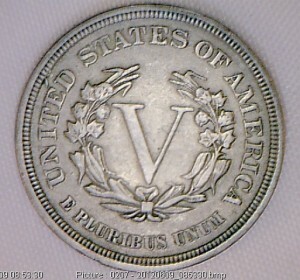 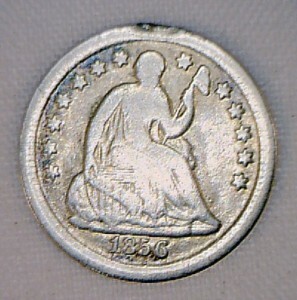 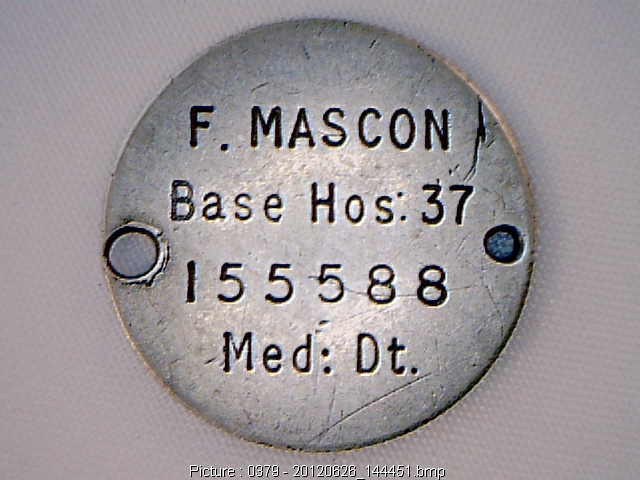 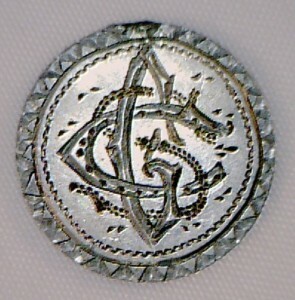 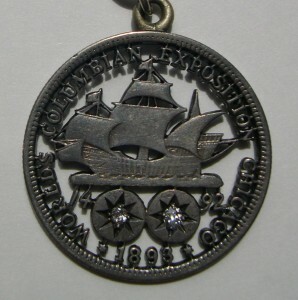 Reverse images are the side which has not been engraved. 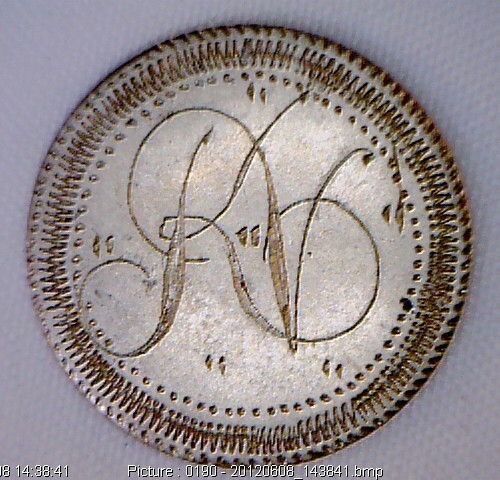 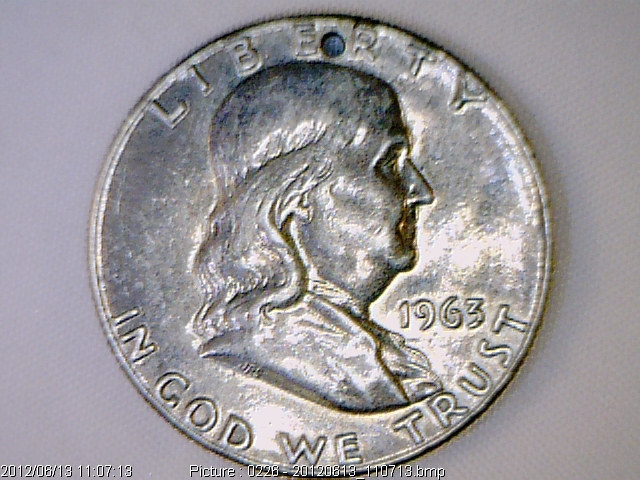 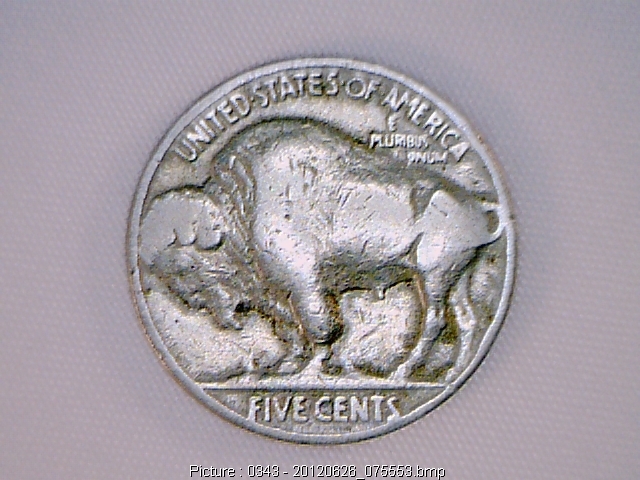 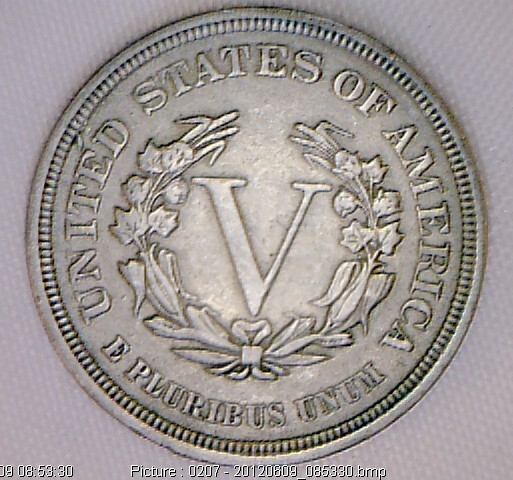 They may not literally correspond with a regular coin’s obverse and reverse.